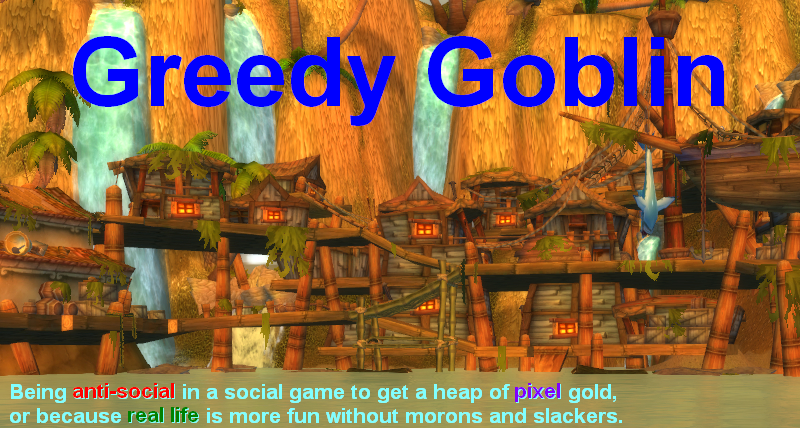 Greedy goblin: Seniority is barely anything. Attitude is everything! Seniority is barely anything. Attitude is everything! NCdot can afford these high standards because competitive players and corps want to graduate to high levels of game-play. There are certainly many exclusive alliances in EVE, but few have the power profile that NCdot projects. At Fanfest this year, CCP Quant showed that Pandemic Legion and NCdot were the centers of experienced players with multiple accounts. These two indicators point to the most competitive players because accounts and age of account work together to produce power the projection of a player. Skillpoints, and accounts to yield them with, are a sign of true PVP potency in EVE, and since both are very expensive to attain, usually only serious players weild them. Who else would pay for multiple PvP accounts and take the time to develop them. 0.2 R2 is a joke. 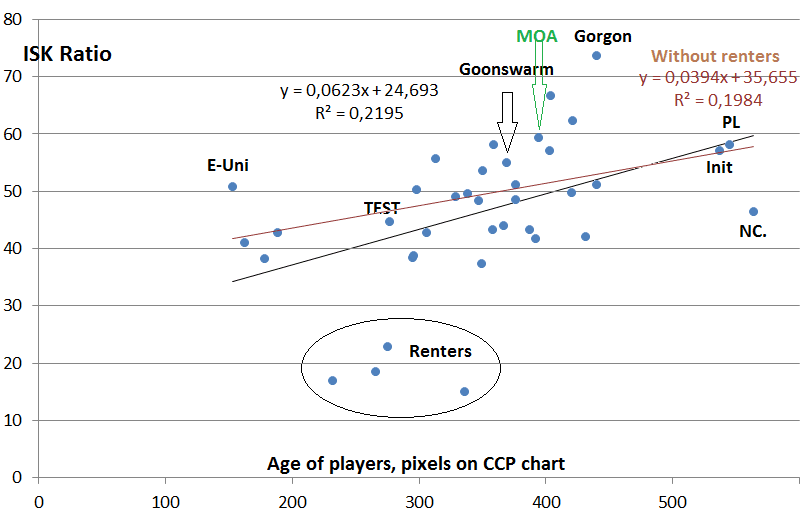 Age has barely any effect on the PvP performance of an alliance. Old players are... just old farts sharing nostalgic stories about the few battles when they were lucky. Getting old together is maybe charming but won't make anyone good. Vetting players based on age is nothing but empty elitism that leads to magnificent failures like B-R and the Fountain invasion. If you want good players, evaluate them over their ISK ratio, not over stats that can be grinded or simply bought on the character bazaar. All this needs is the proper attitude: to measure yourself against measurable stats and not about opinions or "once passed, always passed tests" like character age or total kill count. But socials will always be scrubs as the "old experienced people with lot of SP and accounts" nonsense didn't came from nowhere, it came from social thinking that attributes success to waiting, grinding and networking instead of actually performing. PS: hey look, a 2006 veteran! Almost 9 years of experience and he is still flying an armor Loki with a Crystal pod! Sad but true. No amount of education, status, talent, or privilege compares to the sheer will power to act. In other words: if you don't take the risk, nothing that you think makes you special matters. Sometimes the green behind the ears person, the one who has not been taught to not act, turns out to be superior to those who 'know better'. Figure 2 shows us the total skill points in ten categories for pilots that killed a ship or lost one in null security space. What is noticeable right away is the fact that characters with a lower total number of skill points account for a higher portion of lost ships. 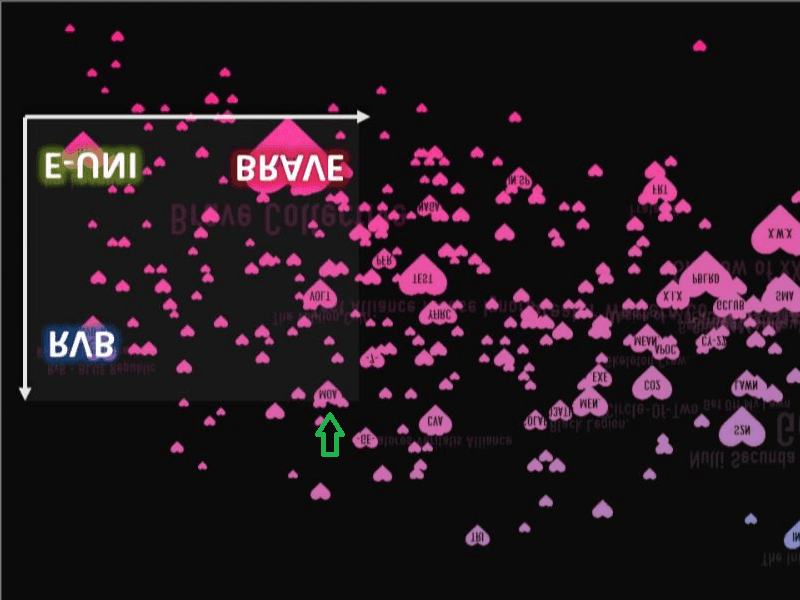 What is also noticeable is that a majority of all final kills in null security space is made by players with more than 50 million skill points. This is in stark contrast to low and high security space, where less than 40% of the final kills are scored with characters that have 50 million skill points or more. As an example, only 35% of all kills in low security space are made by players with more than 50 million skill points and only 35% of all kills in high security space are made by players in this same category. The distribution shows clearly how characters progress within EVE, where pilots move from high security space to low security space and then finally into null security space as their skills and experience grow. Assuming around 20 million skill points per year, these numbers would suggest that it would take the average player around 2 years in order to become competitive in null security space, but that once they have reached that level they are fully competitive with other players. You can kill a hundred frigs without a single loss and still contribute less to the war than a bomber pilot on a ratting carrier kill. You keep making the mistake in thinking that ISK ratio is a proxy for PvP skill when it is clear that it is a better proxy for gank skill. Also you think kills are a useless stat, but what makes you think that ISK is a better stat? ISK is far more useless stat than kills because each kill represents a loss of time which is a far more scarce resource than ISK. I never mentioned "PvP skill", I was talking about winning. I don't think that PL pilots were unskilled in B-R (they did not fit or pilot their titans badly), but they still got their asses kicked. Frig losses are irrelevant as the pilot always expected to lose them, had replacement ready. Losing bling hurts not just because of their price tag but also because it's unexpected so takes time to replace. Maybe one counts ISK and another one counts kills. But I don't see where a kill of 1 frigate equals a kill of 1 titan (ISK-wise, time-wise, effort-wise). Unless, the frigate carries around a stack of PLEX... but that's a whole other story. ISK seems to be the better measurement tool, since every activity can be reduced to it (ISK per time). And the message (old characters with many skillpoints are definetely better) is simply wrong - and dumb, in my opinion. "If you want good players, evaluate them over their ISK ratio"
Logistics pilots are not good players? This is a poor measurement for a single player. You appear to have found a hammer and believe that everything should be treated as a nail. ISK ratio is only one tool, and as you know from your WoW days and from your WoT days, getting top place on the damage meters is far from winning. The notion that only ISK matters is a fallacy. If you want to hold that notion as an axiom, then sure, you are in your right. Just don't assume everyone accepts that. As for experience not necessarily translating into good ISK efficiency - that is indeed true. If ISK was a perfect measure of everything good and worthy, it'd be a problem. However, many people with ton of ISK (and therefore supposedly everyone's betters) are just sitting on that getting bored, using Titans to shoot interceptors, losing Titans horribly and ultimately leaving Eve. Remember that an entity of any size only needs enough ISK to survive amd maintain its usual operations. Maybe a bit of a buffer on top of that. Anything more than that is not strictly needed and is largely personal preference. @Dacheng: in EVE there are no "winning" objectives. Structures and Sov are only means to get more ISK, many players have no such nodes. It's indeed a problem that the best way to get rich is having alts in highsec. I've met with very few "logistics pilots" (one being myself) who flied exclusively such ships. Most players fly everything randomly, so ISK ratio matters. @maxim: OK, then I rephrase it for you: "unless you want to recruit people who are getting bored, using Titans to shoot interceptors, losing Titans horribly and ultimately leaving Eve", you should check their ISK ratio before recruiting. 0.2 R^2 is not necessarily a joke. What it means is that only 20% of the variation in killboard efficiency is explained by age/alts. That's not nothing - the only single variable regressions that tend to have high r^2 are ones with a direct and obvious correlation. Adding variables increases the coefficient of determination - and it would bo logical that isk efficiency is a function of a whole lot more variables than just how many and old alts you have. Such as personality, interest in pvp (I am guessing people who do industry/trading/etc have a lot more alts on average than avid pvpers), chosen style of pvp, and so on. When flying logistics or tackle, pilots rarely do much damage to enemy ships. However such pilots in such critical roles are often primaried and killed. When in these roles, then, their ISK ratio is 0, and that significantly drags down their overall ISK ratio even if they also fly damage-dealing ships on other occasions. "Maybe one counts ISK and another one counts kills. But I don't see where a kill of 1 frigate equals a kill of 1 titan (ISK-wise, time-wise, effort-wise)." The problem is that isk doesn't take into account the wealth of the player. A loss of a frigate to a new player is pretty harsh. To a vet, the loss of a titan isn't. A loss of a titan to me is about the equivalent of a moderate battleship loss to most people. The same works for alliances. A smaller alliance may deal 5x as much damage to a larger one, but if the income of that larger one is 10x higher, then it's irrelevant. The biggest issue with using isk is that they massively inflate effort. A guy in a t1 frigate whoring on a titan is going to get far more isk value in kills, even dewhored, than someone out killing multiple players in smaller ships, even though is real contribution to the titan kill was negligible. Noone is worried about running into a kill whore though, they are worried about running into someone who consistently causes the destruction of ships by outplaying them. Just don't assume that having a bunch of ISK equals winning. For most people winning requires ISK, but does not mean ISK. Necessary, not sufficient. But just how much does ISK ratio relate to winning since number of players are static? For example, say out-of-game internet publicity causes 2000 new pilots to join Goons, TEST or MoA on October 1 and these pilots have a 0.4 ISK ratio. While the associations damage taken would increase, the number of wallets would as well. 2000 new pilots joining MoA would not increase the damage/cost of the veteran MoA pilots and would increase the damage done to Goons. 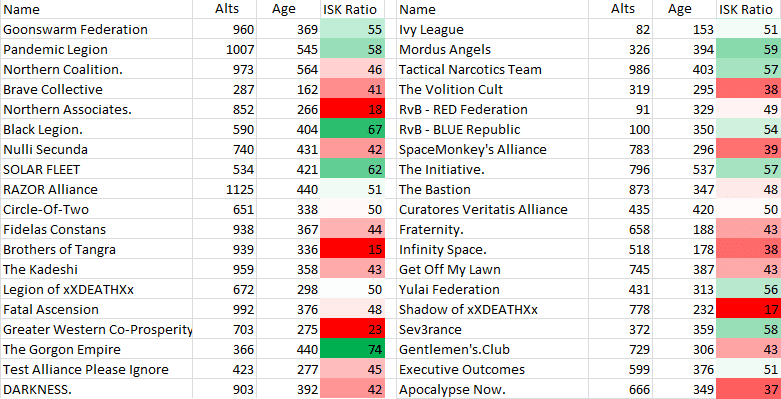 The other side is that any alliance, from PL to TEST/GOONS could boost its ISK ratio by every month kicking the worst, as measured by ISK ratio, 10% of its pilots. It seems to me that ISK damage done is what costs the enemy and ISK ratio is just an epeen tool for kids' egos. I think you are putting the cart before the horse. The success or failure of fleets or whole campaigns comes down to FCs and a few strategic people. Groups are bad not because they recruit those members with bad isk ratio, but rather, flying under these groups for long enough causes an individual to have a bad isk ratio, and vice versa. If an FC orders you jump in and welp a 800bil faction BS it will show on your killboard, despite the fact that you had no control over the event, besides faking a disconnect or something. Logi pilots are an edge case. Stop using edge cases to argue against a generality. Of course not ALL pilots should be measured based on isk ratio. However, on AVERAGE, pilots should be. When it comes to measurement, you need an objective point of reference. Kills are nice and all, but they don't tell you anything about quality. A frigate is nothing compared to a Capital so the measurement of ISK is important - it is the most objective measure you can have. Sure, Logi pilots don't get in on the kills (unless they bring combat drones and use them but in that case they are not performing optimally) but how do you then measure their performance anyways? Repair output matters only if you come out ahead on the ISK ratio - even if you lose a fight, destroying more ISK value than the other person matters (lost the battle but won the war). No matter how you look at it, ISK value is the most objective measure anyone in EVE has of combat performance. Why are you using isk ratio? Isk ratio is meaningless, for example my main has an isk ratio of +92.3% however I'm not a dedicated PVP pilot and only recently started getting into PVP. You can heavily inflate or deflate isk ratio depending on what you kill or loose, so its not a true tell on your skills, or abilities as a pilot. It also doesn't take into consideration what is on field, who are in your fleet or the opponents fleet. I think you are trying to break this down too far and using numbers that to the average pilot are meaningless. The few PVP corps I have been in, both lowsec and null, couldn't care less about isk ratios, their main factor that they watch is that you kill more than you loose numbers wise. Sure in fleets isk value can come into it, but that's more the fact that you kill more value than you loose to make the fleet worth the effort put in. I do not understand the obsession with ISK ratio. Or killboard stats in general, for that matter. If you're Gevlon, you want to give a PVP group ISK to help you achieve your objective. You have a budget and your goal is to spend that budget as efficiently as possible. Therefore it makes sense to compare PVP groups from a purely ISK efficiency standpoint. Most of us are not Gevlon, though. We're not looking to give merc PVP groups money, so the return-on-investment for money is not really something we care about. When we're looking to a corp or alliance to join, the primary question is not "is this the best corp I can get into, in terms of ISK-efficiency? ", but rather "is this the most FUN group I can join?". Sure, we don't want to join a group that's continually losing wars, but "losing" is not something you can determine clearly from wins/losses on a killboard. My alliance right now is clearing out a bunch of POSes owned by our enemies, but that doesn't count as a "win" because they've abandoned the space - it is undefended. My coalition right now is regularly doing CTAs against another enemy, and although we usually "lose" these fights by a narrow margin ISK-wise, the motivational effect they have on our members, as well as the content they provide, means I still think they're a net win for the coalition. Similarly, destroying a lot of an alliance' stuff isn't really a significant win if they have such high income they can easily replace it, and losing something expensive isn't really a significant loss if its cheap to replace for you and/or that loss enables you to achieve an objective. My point is: there's a lot more to combat effectiveness than killboard stats. Gevlon, you have a really good head for numbers, but the numbers you're crunching only scratch the surface - they're relevant for you as an investor, but far less so for most readers. Please, speak to the stats we care about - measure which alliances' members are having fun, and why. Measure which alliances win wars (defined not by killboard, but by taking space/resources or otherwise achieving their objectives) and why. That sort of information will be far more interesting, and far more useful, than simply comparing alliances based on ISK efficiency. Heck, one of the most useful comparisons you could do would be a "which alliances fight / get content regularly, and which just rat all day" comparison. You could then subdivide from there into "alliances that get content because they go on roams", "alliances that get content because they're under attack in their own space" and "alliances that get content because they're being aggressive in war". For me at least, the difference between an alliance with 70% and 80% killboard ratio doesn't matter one bit, but the difference between an alliance on an offensive war and one on a defensive war matters a lot. I like this discussion here, but I think, we've left the starting point behind. It's not about ISK ratio as a tool in general. And yes, in EVE as a game, it's all about fun. In the end, not "Skillpoints, and accounts to yield them with, are a sign of true PVP potency in EVE", player skills are. Is the player able to evaluate his chance BEFORE the fight starts? Is the player able to come up with appropriate tactics? Is the player able to perform his tactics? Is the player able to manage unforeseeable things? Gevlon's numbers normally are zoomed out to corp and alliance level. But one can anticipate back down to pilots: When the alliance performs good, then most of the players should be good at what they're doing. And - back to the fun-part - a single player like Gevlon can't beat the Goons by ISK. But he can manage to lower the fun for goon players by paying for the fun of merc alliances. Maybe one day such a player will leave the Goons. I appreciate the counterpoint, although naturally we disagree about NCdot and the article. My point was Accounts/TimePlayed=pilot potential power. That's very logical, and CCP stats show that it takes 40m skillpoints (2 years) to be competitive in nullsec, that fits with my experience to some degree. Depends on situation, but generally that seems right too. Your normalized isk ratio is problematic (although nice job on the research). It doesn't account for what fights FC's take and refuse to take. What is sacrificed for the objective, etc. And all the 3rd party whoring. Something as simple as E-Uni showing up en-mass to a Titan kill event will distort the results. 2014 was a bad year for PL/NC with the loss of 60 titans in 1 day (Jan) that made the rest of the year about rebuilding. 2015, everything been dead and few caps have been used so many players went to sleep. Love to have you on EN24's podcast to discuss if you change your mind.